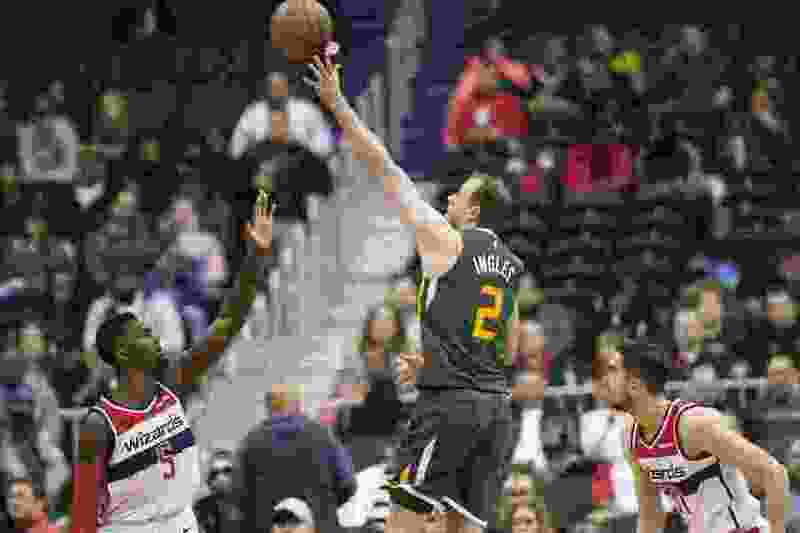 Three thoughts on the Utah Jazz’s 116-95 win over the Washington Wizards from Salt Lake Tribune beat writer Andy Larsen. Bradley Beal had scored 40 points in his last two games, including doing so in just 17 shot attempts against the Grizzlies. So at the top of the Jazz’s scouting report was one big flashing headline: STOP BEAL. The Jazz did. They ball-denied at every opportunity, making it difficult for Beal to even get the ball in his hands. Naturally, the Wizards started running him off screens, but the Jazz used a defensive strategy called “top locking” in order to prevent him from getting open on the move, either. For a really awesome discussion of top locking, check out Dylan Murphy’s page here at The Basketball Dictionary. Essentially, you face-guard the player when he’s about to go around a screen, making it so that he has to backcut instead. Sometimes, that means layups like this. That backcut is a dangerous pass when you have the long arms of Gobert lurking down low, and Joe Ingles is pretty long, too, so that pass has to be perfect. Tonight, it wasn’t really there for the Wizards. So another common strategy is this one, where the shooter comes off a screen at the other side of the floor instead. This video is of Joe Ingles top-locking Kyle Korver when he was on the Cavs, so Korver goes all the way to the other side of the floor to get the screen instead. Ingles is hopelessly trailing. Beal probably didn’t do this as much as he would have liked, given the Wizards system, but when he did, the Jazz did a good job of sending help to prevent that pass, too. The cumulative result was a lot of Beal not getting the ball. Ingles did a fantastic job of staying physical, but within the rules, while executing this strategy. That’s not a tactic you pull out super often, but it’s useful when you play the league’s top shooters. Beal said he hadn’t been face-guarded this much since high school, but the strategy absolutely worked for the Jazz. He scored only 15 points, and the Jazz cruised to a win. I couldn’t believe some of the Wizards’ defensive plays, and not in a good way. Pop quiz: who’s a better shooter, Joe Ingles or Ricky Rubio? Jabari Parker fails this quiz miserably. Duke is a better school than this. Okay, but Ingles misses the shot, but the Jazz get the offensive rebound anyway. The Wizards have an opportunity to make amends on their error! Except that Parker hands out 10 feet away from Ingles again. Gobert goes and sets a screen, but I’m not even sure he needed to; I’m pretty convinced that Parker wouldn’t have closed out either way. This play is from earlier in the game, but I think it’s even worse. It’s a communication error, I guess? But what does Parker think is going on here? He wasn’t the only culprit, but he was the one that made it most obvious. There’s a reason he’s on his third team. With a $20 million club option for next year, it might be four really soon. Parker led the Wizards with 19 points tonight. Points aren’t everything. The Wizards started Bobby Portis at center tonight. Portis is taller than I thought he was: he’s 6-foot-11, with a 7-1 wingspan, but he’s still no match for the 7-1 Gobert, who has a 7-9 wingspan. It used to be that you could get away with this. I remember that once a few years ago, Portland head coach Terry Stotts put the 6-9 Dorell Wright on Gobert, and found some success, as Gobert couldn’t really take advantage down low due to his inexperienced postgame and general lack of coordination. Some of that’s just Portis not being a very good defender, but that’s a nice sweeping move by Gobert. Gobert thinks the Jazz should run more plays with him with these mismatches, and sure, I suppose he’s got a point. But hey, the other alternative is to get shots for Mitchell, Ingles, etc., and then have Gobert get the offensive rebound if the shot misses. Either is pretty effective.